Obscured number plates could land motor vehicle drivers before the court of law. 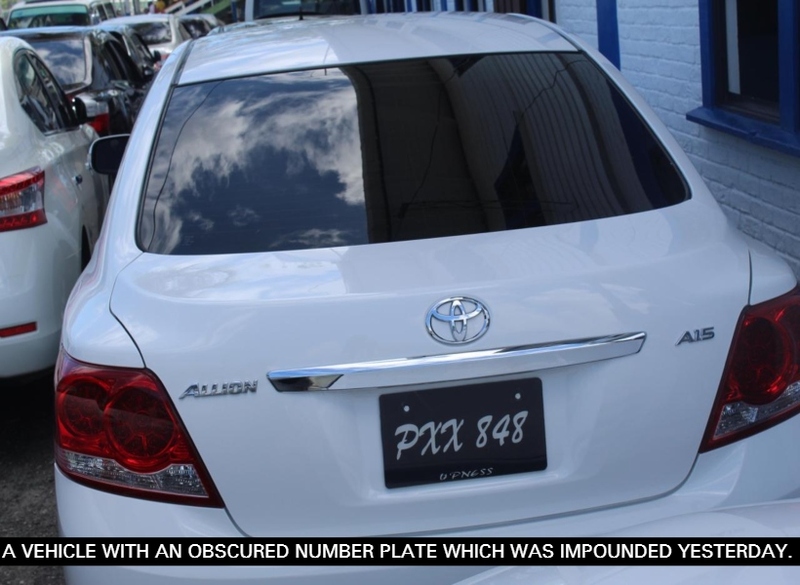 This development comes even as the Guyana Police Force introduces a campaign geared at targeting vehicles with obscured identification mark [number plates]. In this regard, yesterday, ranks of the Force’s Traffic Department, Headquarters Eve Leary conducted an exercise in Georgetown which nabbed a total of 27 defaulting motor vehicles. All of the vehicles found to be in breach of the aforementioned Offence were impounded. However, this was not before the drivers of the vehicles were briefed on their infraction. But it wasn’t until after rectification and examination by Licence and Certifying Officers, that the drivers were warned and their vehicles released to them. However, ranks of the Force are not likely to be so lenient with other drivers caught during the campaign. Moreover, the Force is has issued an advisory to the public that all motor vehicles driven on the roads must have a distinctive identification mark consisting of a figure or figures and a letter or letters. The letters and figures on the identification mark must be indelibly inscribed in white upon a black surface and no letter or figure shall be capable of being detached from such surface. All letters and figures must be three and a half inches high; every part of each letter and figure must be five-eighth of an inch broad and the total width of the space taken by every letter or figure must be two and a half inches. Traffic Chief Superintendent Linden Isles is therefore urging owners and drivers of motor vehicles to comply with the law as it relates to Identification Mark (number plates) or face the consequence of being prosecuted.